The appearance of the car is one of the things that a car enthusiast feels immensely proud of. However, too much focus on the outward appearance of the car while neglecting the cleanliness can be counter-productive. As the adage goes, a clean car is a happy car. In this article, we list the 5 ways to get a squeaky clean car at home. Using the right ingredients is the first step to cleaning your car thoroughly. The primary ingredients for car cleaning include car wash soap, wash mittens or sponges and two buckets of water. The car wash soap is excellent for removing accumulated dust without damaging the wax coating on the body of the car. On the other hand, wash mittens made of sheepskin or microfiber cloth is designed for the sole purpose of trapping loose dirt. You should also keep soap and water mix in one bucket and plain water in the other to avoid planting the dirt again on the car surface. Other key ingredients include wheel and tire cleaner and dry towel. The tire cleaner is great for removing brake dust and metal shavings from the wheels. Dry off the wet surface with the towel to avoid water drop marks on the car. Start cleaning your car from the bottom up, more specifically, starting with the wheels. This will ensure that the grime from the wheels won’t be ending up on the clean panels of the car. Hose and spray the wheels and rims to remove the dirt layer. After that, scrub the wheels and spokes with a brush to dislodge the brake dust. Rinse with water to leave the wheels clean as a whistle. Hose down from the top of the car to let gravity pull down the dirt off the surface. Scrub down for moping up any loose dirt with your wash mittens.Alternate between soapy water and plain water as you clean the car panel by panel. Make sure you give the car another fast quick scrub with soap water so that no dry water drop marks are left on the surface. After you’re done scrubbing, spray the surface of the car with a jet of low pressure water. Keeping it close to the body, push the dirt and soap suds off smoothly. This also eases the drying process, because water droplets aren’t allowed to form. Don’t forget to clean the wheels once again to get rid of any dirt that might have fallen on them. After you’re done hosing your car down, it’s time to dry off the surface with a towel.Drag the towel across the panels for the best effect. Wipe down anywhere the water might have trickled down to. Use a different towel to dry the wheels. Last but not the least, the secret to having a squeaky clean car is to clean it regularly. We'd say, once every three weeks is fine. The decision is ultimately yours to make. 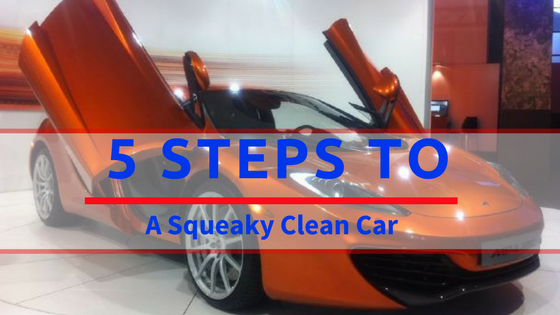 Follow these five steps to have a squeaky clean car that looks just as good as it runs.